The Flux ON event is about seeing see hot new talent on the rise, and seeing it first. If you have a passion for jewellery and you want to know more about our alchemical processes, and if you know what’s good for you, you are virtually in the right place; please come to these events. the event was presented through Flux Studios which is a London based jewellery school offering fun classes workshops and access to a fully equipped studio. 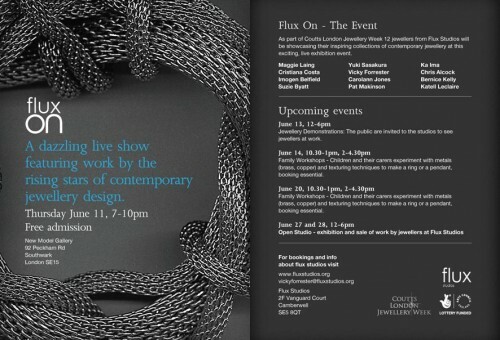 Please see Flux Studios for all course details for courses starting in September. Tagged Classes, Exhibitions, Gems, New Works, Review, Techniques, Tools, Wearables, Workshops. Bookmark the permalink.